Our Malkia Junior suites live up to their definition, ‘Queen’. 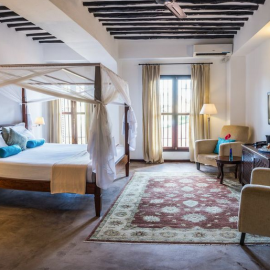 These three suites one on each floor are larger than our Burdani rooms. Two of the suites have a stand alone shower and a freestanding bath. One of them has a separate sitting area, ideal for a family with children. Decorated with elegant Swahili sophistication; a suite fit for a Queen.